Before I begin … I’ve always found the term Human Capital Management (HCM) to be very in-humane and cost focused. To challenge this traditional mindset I am going to redefine HCM as “Human Collaboration Matters”. 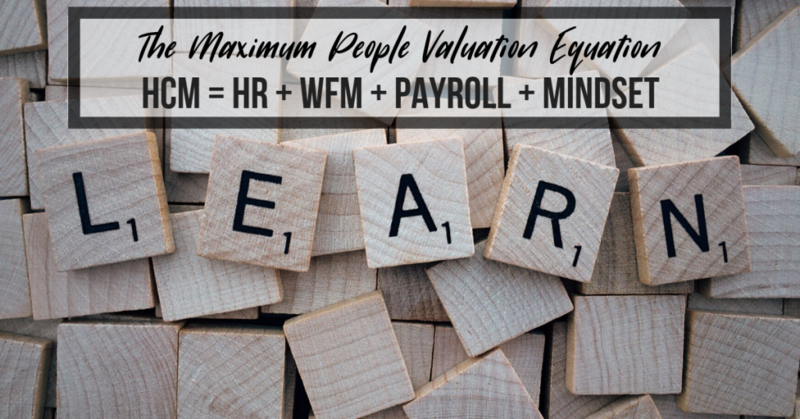 Nowadays, as the focus on people experience, not just people cost grows, specialist Workforce Management (WFM) systems are often being implemented alongside traditional Human Resources (HR) and Payroll technologies. These WFM systems are designed to provide complementary functions, such as the ability to create flexible work options for your people and to provide a complete real-time view of your workforce. 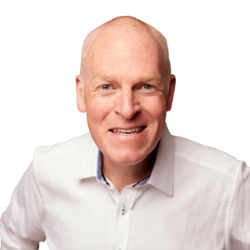 The problem is, you can’t simply smash separate HR, WFM and Payroll systems together, in the hope that they’ll talk to one another and operate cohesively while providing a frictionless flow of work to the end user. 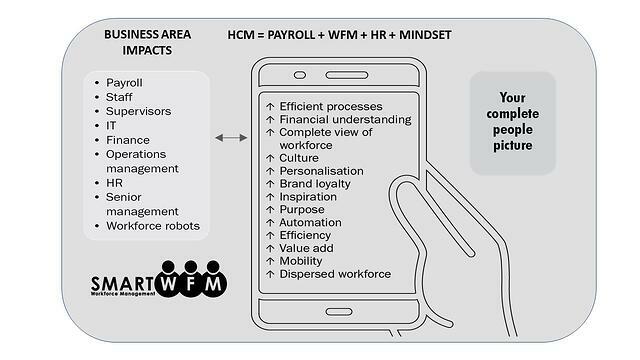 Underpinning this view of people through a single lens, is the need for business to break the traditional operating silos across HR, WFM and Payroll to deliver optimal people, process and technology business outcomes in a simplified and easy to usmanner. Here’s a practical 10 step framework you might like to consider, before pushing the go button on people initiatives in your business. The correct mindset is required to obtain maximum people value. This is the basis for any people, process and technology initiative. There is no silver bullet to align mindset just a desire and belief to open your thinking to what might be possible. Understand why you are taking on your people based initiative. What are the benefits and what are the measures? This is required to keep everybody on track and to show you have delivered what you set out to achieve. Agility is key to delivering a frictionless flow of work along with realizing value in an accelerated manner. Get the process and technology in front of people straight away to facilitate adoption. Agility also enables tweaks to be made as you deliver ensuring continuous improvement while demonstrating you are achieving your outcomes and benefits. There is strong integration with HR, WFM, payroll, finance and in some industries, job management and forecasting systems. There are many permutations of which system functions are completed in what systems to deliver a frictionless experience. 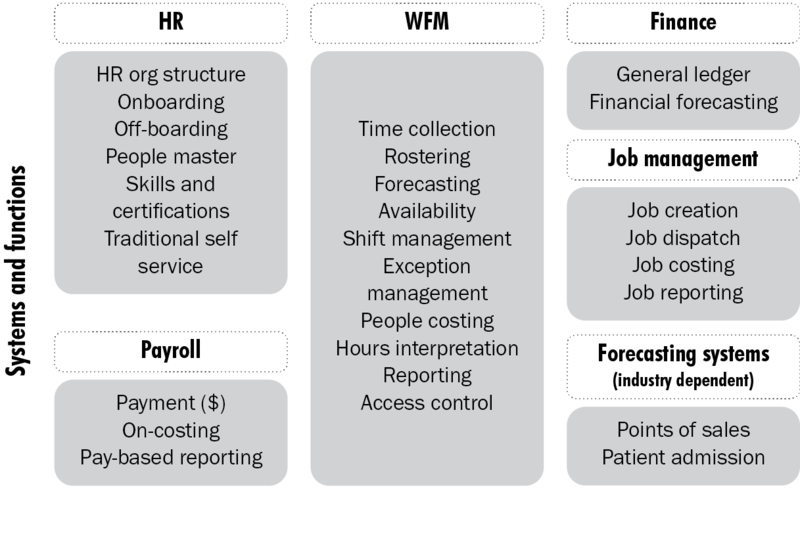 The figure below provides a simplified sample architecture from a systems perspective that could be tailored to your organization’s unique situation. What system will leave be completed in? What user interface will be used for mobility? Where will self-service be completed? Where will award interpretation be completed? My recommendation is to deal with all these questions at the outset of your initiative. When determining the answers, ensure you consider what this means to an end-user and whether the system has been built by the product supplier to deliver those specific end-user requirements. Understand what functions reside in what system. Understand your technical requirements early in the implementation process. Engage with the IT team to identify any standards they have in place and work with them to design an optimal operating technical architecture. From a project implementation perspective, there is a changed focus on technology with cloud. While many of the on-premise considerations still stand true, the focus on individual areas may change. For example, with cloud, many of the server considerations are removed. Some product suppliers are building their applications on an open application processing interface (API). This means that it’s possible for you to send and receive data to/from almost any complementary platform. In turn, this is seeing best-of-breed platforms being selected to achieve specific functions, e.g. onboarding, people master, rostering, payments, pay and so on. HR, Payroll and WFM platforms then require a number of other technology-related questions to be answered around application security, integration, consolidated reporting, user interface, etc. Are all devices capable of running each of the HR, WFM and payroll applications and how do you achieve a single flow of work across your organisation? Do some functions need to be completed on another technology? Do I need to use a PC? Can I use voice? Are multilingual capabilities available across the mobile devices/operating systems? Are there nuances between Android, IOS, Windows working seamlessly together? Organisational benefits are generally delivered following a defined process. Automate where possible to free up time to work on value add activities. Process also needs to be carefully considered from a technology perspective. For example, if you complete a business process across a number of systems, will the outcome be usable from an end-user perspective? Will the flow of work be frictionless? Designing process architecture will help to mitigate the risk around this. The greater the number of system and technologies in play, the more important data architecture becomes. Ultimately, the data that resides across your systems will be required for operational, management and predictive analysis. Understanding where data resides, where is its source of truth, how clean is the data, what systems require it and at what frequency, becomes critical. Data is also the ‘fuel’ for Artificial Intelligence (AI) and accurate data is required to ensure that any AI prediction or automation is correct. It’s analogous to teaching in real life, if you teach the wrong thing you will learn the wrong thing. family: such as spending some additional time with them each week. My supported foundations are pledge1percent and the Cathy Freeman Foundation which supports bridging the education gap between indigenous and non-indigenous Australians. What are yours? I hope this framework allows you to take some actionable items into your workplace to drive improved people and business outcomes. Human Collaboration Matters to achieve maximum people value!